You name it, we can provide a 301 redirect link from it! I will register a domain on your behalf, which has a backlink from one of these sites, and redirect this newly registered domain to your site. The link juice from these powerful websites is then passed on to your website. This is a safe and inexpensive way to build excellent authority for your website and improve your position in Google. We pride ourselves on offering the best service. For a limited time only, to build our reputation on SEOClerks, we can do 1 link for $50. Q. What is a 301 redirect backlink? - I will find a broken link on a top website that is relevant to your niche and register the expired domain which has the broken link and redirect this domain to your website. Q. Can I change the article and the anchor text? It is not possible to modify the article. All we can do is change whether the broken link on a website such as Forbes links to. Q. What are the benefits of this gig? This service is perfect for any site that wishes to improve their authority and boost their overall SEO activities. This is a safe and inexpensive way to get link juice from one of the world's most powerful websites. The redirect only takes a maximum of 24 hours to work. Q. Can I see an example of a 301 redirect you provide? Sure, I can send you examples before you order. 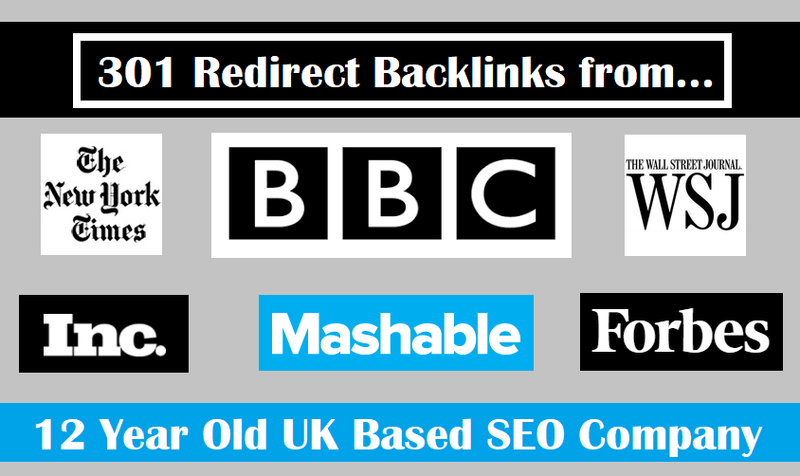 Provide a 301 redirect backlink from Forbes, Nytimes, BBC is ranked 5 out of 5. Based on 8 user reviews.